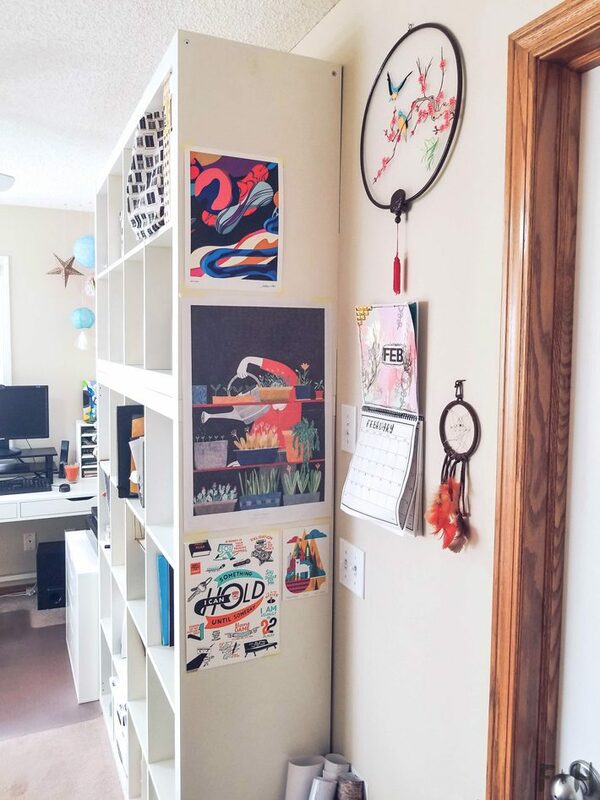 As promised, today I’ll be sharing the second half of my home art studio tour. 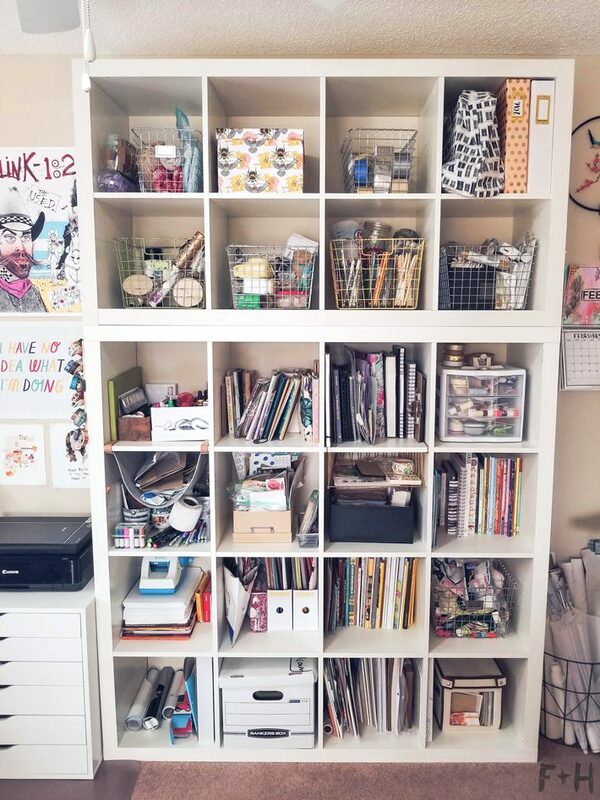 These posts are long, but I wanted to give you a detailed look at my workspace. I find that Pinterest has a lot of really lovely looking studios/offices, but few that are real-world practical. Like I have white furniture, but this is no minimalist Scandinavian dream studio. 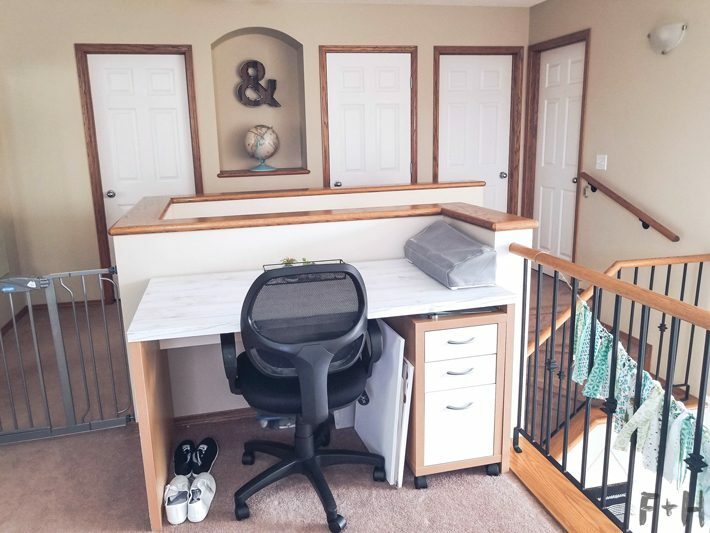 It’s real, it’s in my real house and I didn’t spend $5000 remodelling it to be Pinterest perfect. If you want to check out the first half of my home art studio tour, then be sure to HEAD HERE to see it in full. I go over my combined computer/art desk side of the office in detail. Now, we move on to my storage wall! Yes, a wall. A whole wall of storage. This is my glorious (and slightly dangerous) wall of storage. These are two Expedit (now Kallax) units from Ikea that I have had in my office for ages. Like going on 7 years now. I’m obsessed with them and refuse to own any other storage system. I originally had them side by side (one is 4×4 cubes and the second is 2×4 cubes) but we decided to stack them to free up some floor space. And don’t worry, they are anchored to the wall so I will not be crushed by my supplies, haha. As you can see, my shelves are a hodgepodge of all my art supplies. I have a variety of wire baskets, shoeboxes, organizers, etc to attempt to keep it orderly. 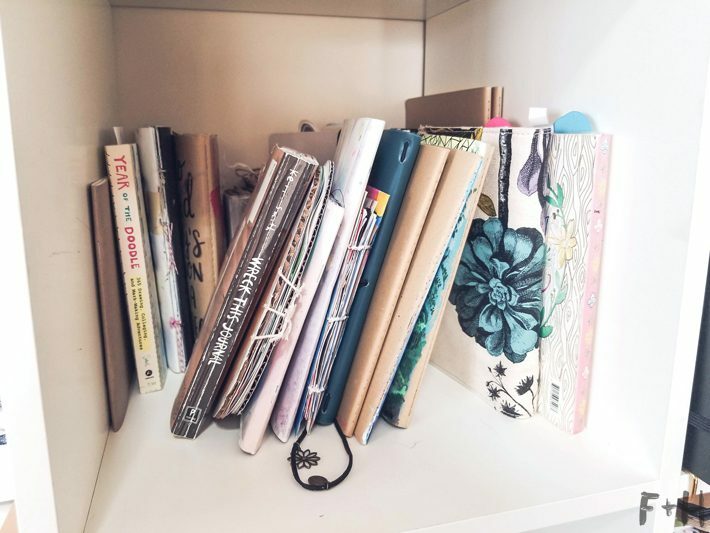 I won’t bore you with everything in each shelf, but here is some of my art journals! This is another little art nook I have in my space. I try to add it where I can since I don’t have much wall space in here! The large plant poster is another from Frankie Magazine. The top print and bottom letterpress print are both from Mohawk Maker Quarterly. And the lil postcard is by illustrator Patrick Hruby. The dreamcatcher was made by 8-year-old Torrie at Brownies camp in 1998. It’s vintage. Here is the “doorway” to my home art studio, which is a lovely baby gate. The one downside to this studio currently is that it doesn’t have a door, so there’s no way to keep anyone out. And by anyone I mean my small children. 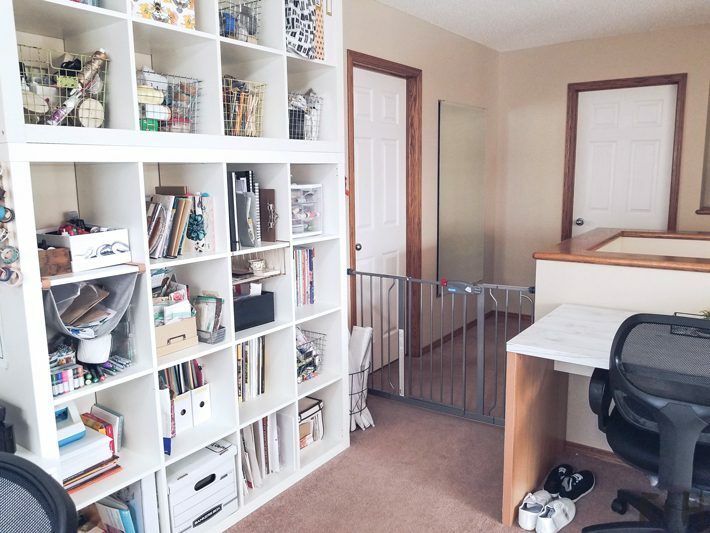 So we installed this baby gate to keep little hands from getting into mommy’s art supplies. We didn’t need this until my youngest started walking shortly after Christmas and was hellbent on eating my paint tubes, haha. But you can see that it opens up to the hallway and the rest of the second floor. And this is my second workstation!! 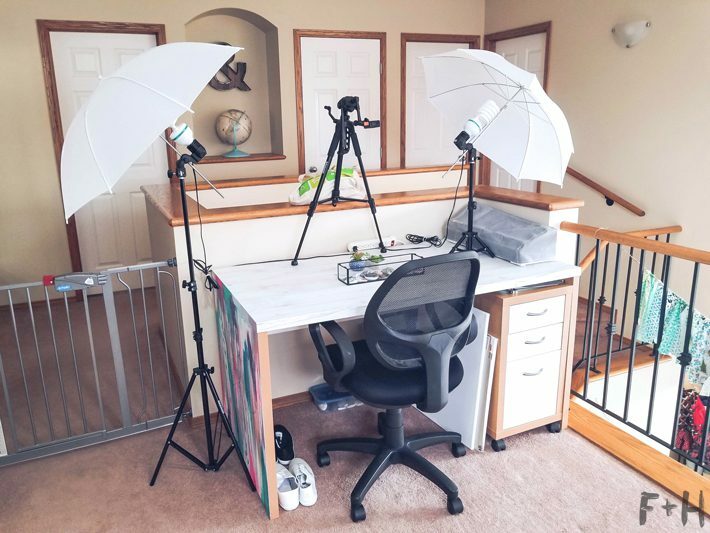 I mainly use this desk for all my filming/photographing tutorials on this blog and my YouTube channel. It is an old Malm Ikea desk and drawers that I’ve had since high school (10+ years now). That is my Silhouette Cameo 3 tucked away, and this is the only time this desk will probably ever be this clean. Also, sorry it’s so crooked – not sure how I didn’t notice until I was writing this post! Now, this is what my desk looks like my filming set up is…set up. I use this photography lighting kit, this tripod and tripod arm for everything I film/photograph. You might be wondering what camera I use. Plot twist: I do everything on my phone! Yup. I have a Samsung Galaxy S8, and I use it to photograph and film everything (including this studio pics!) I have a digital camera, but it’s about 10 years old and my phone just takes better quality images. 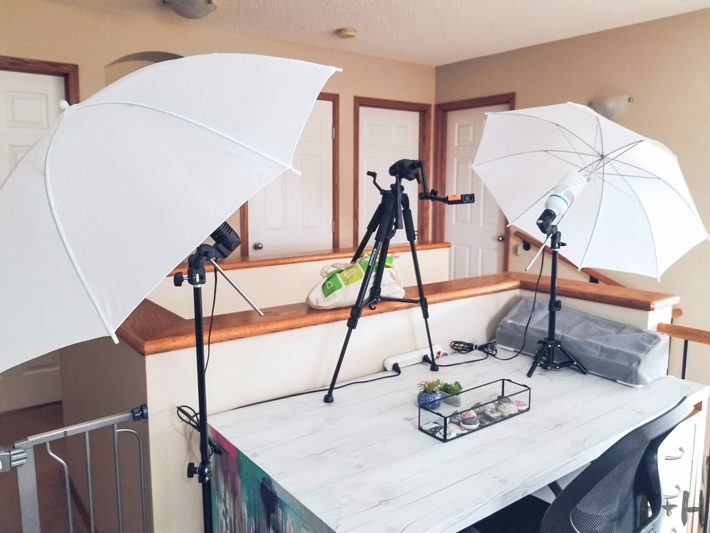 So if you don’t have a super nice camera or feel like you need one for blogging, you don’t. If you have a fairly new smartphone it more than likely has a great camera in it. Click “Next Page” below to see the rest of my home art studio tour!